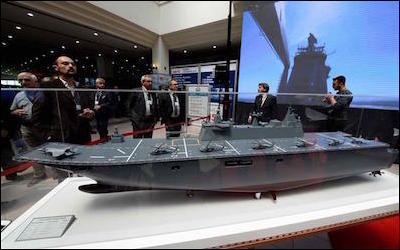 A model of the TCG Anadolu, Turkey's first amphibious assault ship, now under construction. Speaking at the ceremony, Erdogan praised efforts for Turkey's all indigenous development programs, including the LPD, although he called the ship's production "a belated move." He said that Turkey's dependence on foreign arms systems has dropped from 80 percent in 2002 — when his government came to power — to 40 percent. "We must aim at zero dependency by the year 2023," he said. Erdogan said that the LPD program would hopefully be the first step toward producing a "most elite" aircraft carrier. Then he upped Turkey's naval ambitions. "I see it as a major deficiency that we still do not have a nuclear vessel," he said. But officials and experts are cautious. "I am not sure if we can afford such ventures in the short-run," said one procurement official. "I am not sure, either, if such grand designs would fit our security threat perceptions."